We just wanted to say thanks for all of your support and interest in our journey this year. 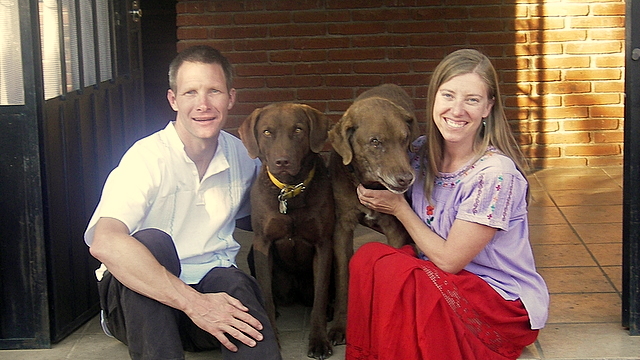 This picture is us in front of the little casita (studio apartment essentially) we rented in Oaxaca.We wish you happiness and hope in your adventures in the new year, wherever they take you! There’s a saying here amongst travelers and expats that “you never know what is around the corner in Mexico”. Well that was certainly true today. Another beautiful day in Oaxaca. The weather here is so good here, it can be a bit boring. So, the big item on the to-do list today: head downtown with Del to mail a package home and help him with all of his packages for the holidays. Easy enough, I might even get some hammock time later on. By way of introductions, Del is an ex-pat from Michigan who has lived at the San Felipe trailer park for the last two years. He and his wife Kate, a Canadian, have traded in their 5th wheel trailer and now rent one of the small studios that dot the edge of the trailer park. Together they run an ebay business exporting Oaxacan folk art and you can check out their beautiful carvings at http://myworld.ebay.com/treasurehunters4ever. Del’s role in the operation is packaging and shipping so he goes into Oaxaca once or twice a week to mail orders out at the central post office. They’ve been generous enough to help us negotiate the intricacies of Mexican shipping so I’ll be accompanying him into town today to help out. We load up the back of their bright red Jeep Cherokee (they call it the Heap as that’s how Jeep is pronounced in Spanish) with a stack of boxes and head down the hill towards the city. As we go Del entertains me with stories from growing up in Michigan. Looking down the road for the source of his frustration I spot uniformed traffic cops directing traffic off of the main road onto the side streets. No construction, detour signs or anything, you just can’t seem to go this way. “Looks like their doing it again.” Del exclaims. “Doing what?” I ask, puzzled. A break for a little Oaxacan political history. Demonstrations are fairly common in Oaxaca and they are often by held by teachers asking for pay increases and supplies. It seems that the only way teachers get raises is by raising hell. In fact in rural areas we’ve been stopped by school kids and teachers holding a rope across the road. Once we’ve contributed to this unusual fundraiser they drop the rope and let us proceed on our way. Maybe the PTA back home should consider trying this! In Oaxaca the teachers’ strategy is usually to disrupt things just enough that the governor will have to talk to them. Their favorite ways of accomplishing this are by camping out in the town square and by hijacking buses and using them to block off major roads in town. The protests are almost always peaceful and typically they eventually they get a concession and life returns to normal for awhile. Last summer however, protestors from the teachers union were staging their annual demonstration in the town square when the new governor sent in the troops. Predictably, things got ugly, and when protestors started getting killed every union in Oaxaca joined the demonstration. Finally the president had to step in with federal troops and ordered the governor to negotiate with the demonstrators. They eventually reached an agreement but not after shutting down the town square for months. The tourist economy is still struggling to recover today. If you want to read more about Oaxaca and an excellent article detailing the conflict check out this link: www.tomzap.com So this protest that Del and I had stumbled into was just another in a series of fights for better wages. From the U.S. perspective it may seem the protests are unreasonable. However to get a picture of the discrepancies here think of this: This is a country where low level bureaucrats get picked up each day at their homes and flown to work in government helicopters while the local women wash clothes in the streams that run in front of their mansions. Back on Avenue de Ninos Heros, I could tell Del was trying to come up with a plan. Apparently this had happened here last week and he never did find an alternate route to the post office. I watch as Del waves happily at the cop directing him right and then proceeds to bypass the barricade through an empty gas station. This being Mexico there are several other cars pulling the same move and the cop doesn’t seem one bit fazed. Past the barricade the normally busy street is quiet with only a couple other rogue vehicles on the street, some driving the wrong way in the lanes. Ahead we can see a bus that is pulled across the street blocking all progress. The few folks that are around don’t seem to be protestors, so Del pulls right up to the bus and then starts an end run around it by pulling up onto the sidewalk. He startles an elderly lady who scampers into the empty street while Del nonchalantly cruises along the sidewalk. Now past the bus, we ease back into the street. Another block ahead of us is another bus, this one surrounded by demonstrators. At this point I begin to recall some of my reading about travel safety. Political unrest in a region is no reason to not to visit it I remember reading. They said just make sure to stay away from any protests or demonstrations and you’ll usually be fine. Great, I think to myself. Now, what? I’m not so sure I share his sentiment and wonder what he has in mind. As he opens the trunk, I climb out and try and figure out his plan. Noticing my confusion he points past the bus in front of us. “The post office is only another block. We can walk from here. I’d never be able to carry all these boxes myself but I think we can get them all in one trip.” He seems oblivious to the fact that we will be walking right through the demonstrators. Trusting in his bravado and experience I don’t say a word as he stacks my arms full of boxes. They stack high enough that I can sort of hide behind them and don’t have to look at the protestors as we pass. What a silly sight we must be to them, two gringos tottering through their midst with a tower of Christmas packages destined for the states. The bonus was that the post office was open but empty. While we waited for our packages to be processed I found myself repeatedly looking down the street for signs of smoke. Fortunately when we returned to the car it was in one piece and we had no problems bypassing the first bus again. After running a few more errands we returned home. Just another Mexican mail run and I still had time for that nap! Hi everyone…finally got the video camera to synch with Windows Vista (if you have a similar problem email me and I will link you up with the right codec to fix it! )…so here is just a brief video of van life….more and BETTER ones of our adventures to follow!